Tel Aviv’s Bana restaurant opened less than two years ago and quickly became one of the most talked about vegan establishments in the city. The light and pleasant space, the quiet courtyard behind the restaurant and particularly the natural offerings centered around a range of fresh vegetables, fruit and herbs have turned Bana into a real favorite of vegans. As a result of its proximity to Rothschild Blvd. and boutique hotels in the area, it has also gradually become a favorite for a considerable number of foreign tourists, who can be seen taking pictures of the food for Instagram. Following a gluttonous wave of decadent brunches around the city, I happened upon Bana by chance, and it was the surprise of the season. For weeks now, I have been in search of the Tel Aviv area’s best breakfast establishments, but I stumbled upon Bana by chance. The restaurant just started serving weekend brunch, and without too much exaggeration, it looks like a real hit. And it’s also worth telling those of us who are not vegan that Bana offers a breakfast that will please everyone, even finicky children. 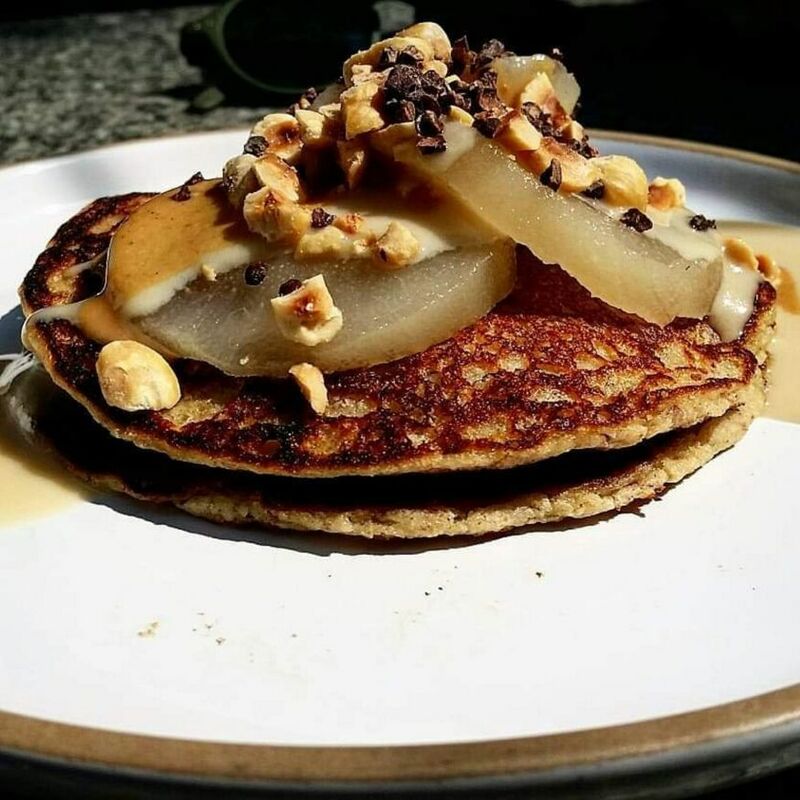 This is a stop for anyone seeking to do a little good for their bodies, with a weekend breakfast of spelt, full-flavored vegetables and even sinfully sweet offerings. The inaugural brunch menu, which apparently could be subject to change, begins with a tray of starters at 48 shekels ($12) that includes thick sourdough spelt bread that is full of grains and seeds. It comes with portions of tahini and sweet, deep-roasted tomato, the juices of which have been baked in. There is outstanding tzatziki featuring tiny cubes of crispy cucumber, lettuce, shaved carrots in vinaigrette, flavorful charred beets, potato salad with white horseradish and chives, roasted eggplant salad and olives. The starters manage to whet the appetite but also to establish the diner’s trust in the chef. We chose to continue with a dark and satisfying sour spelt pastry filled with spinach and leek on mint tzatziki (45 shekels). The generous portion of flavorful spinach and leek was steamed and then roasted. 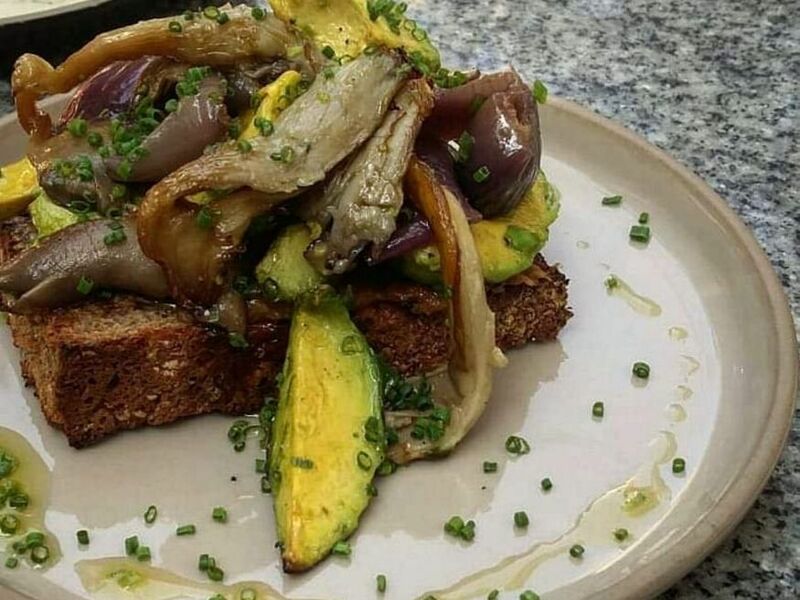 A large spelt bruschetta topped with garlic confit, grilled avocado slices, wild mushrooms and baked onion (44 shekels) was another rather full-flavored, satisfying item. I am personally not a fan of the new trend to abuse avocado at overly high temperatures, but in this instance, the singeing only improved the dish and complemented its otherwise already smoky, complex flavor. In passing, it was nice to discover that the cocktails at a vegan restaurant could be the real thing. They were clean-tasting rather successful natural drinks that were free of sugar or concentrates. There was, for example, a cucumber ginger gin, a pineapple mojito and even a white anise with ouzo, almond milk and mint. 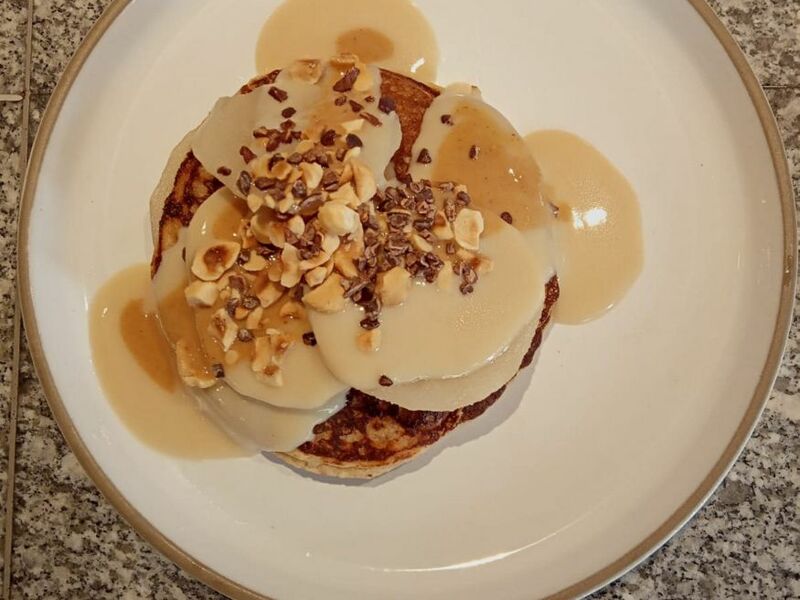 For dessert, there was a particularly airy pancake made of bananas and oatmeal that arrived at the table. Between the layers, there was a marvelous white wine cooked pear and toffee sauce. It was sweetened, but not overly so, with agave. It’s a wonderful and satisfying menu item the sweetness of which is reinforced by roasted hazelnuts and natural bits of cocoa (35 shekels). The Diemme coffee cappuccino here is made with rice and almond milk and is served with a huge dense and very sweet chocolate cookie. Beyond what we actually tried, the brunch menu also features items such as a crispy selection of apple, fennel, cucumber, zucchini, lettuce and celery in a horseradish tahini sauce (45 shekels), a spelt waffle with roasted mushrooms, cashew cream and nutmeg and walnuts (48 shekels), and a cashew quiche with zucchini that is served with a small salad of tomatoes, roquette, radishes and olives (45 shekels). There is also hash browns with aioli and lemon zest (38 shekels), a Bana toast of peanut butter, jam, roasted bananas and cocoa nibs (32 shekels) and sweet items such as citrus banana cake (24 shekels), verbena panna cotta, strawberry jam and peanuts (36 shekels) and chocolate-covered cashew ice cream cubes (24 shekels). It’s also worth noting that the morning cocktails, including a Kir Royale, a mimosa and a Campari spritz, are available for just 19 shekels. All told, what we have found here was one of the best breakfasts in Tel Aviv, and it just incidentally happens to be vegan. Bana. 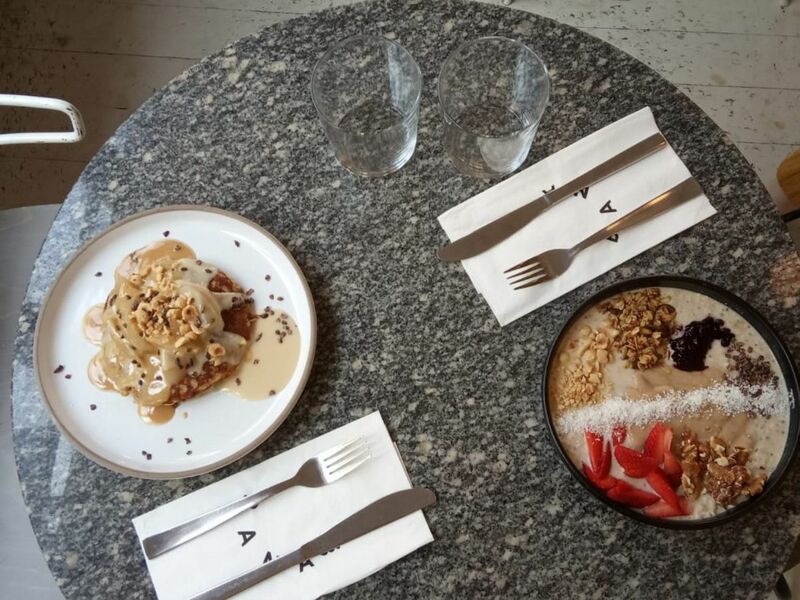 Friday and Saturday brunch from 10 A.M. to 1:30 P.M. 36 Nachmani Street, Tel Aviv.